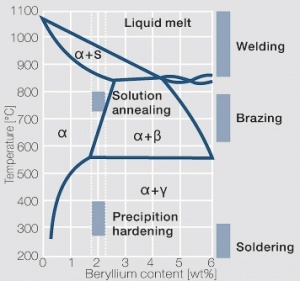 The cause for precipitation hardening of CuBe materials is the rapidly diminishing solubility of beryllium in copper as temperature decrease. 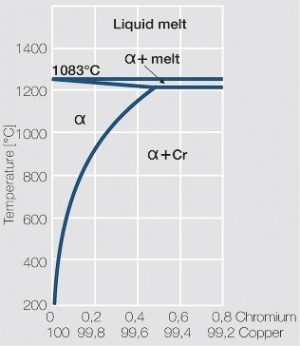 As the phase diagram for CuBe shows, 2.4 wt% of Be are soluble in Cu at 780°C Figure 1. 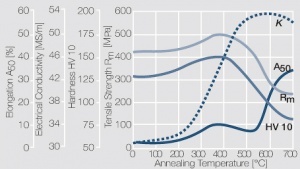 In this temperature range annealed CuBe alloys are homogeneous(solution annealing). The homogeneous state can be frozen through rapid cooling to room temperature (quenching). 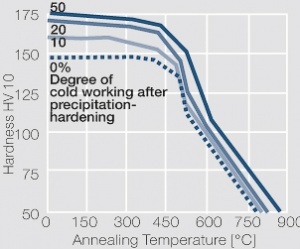 Through a subsequent annealing at 325°C the desired precipitation hardening is achieved which results in a significant increase in mechanical strength and electrical conductivity of CuBe Table 1. The final strength and hardness values depend on the annealing temperature and time as well as on the initial degree of cold working Table 2 and (Figs. 43 – 75). As precipitation hardening alloys CuBe materials, mainly CuBe2 and CuBe1.7 have gained broad usage as current carrying contact springs because of their outstanding mechanical properties. Besides these CuCo2Be and CuNi2Be, which have medium mechanical strength and a relatively high electrical conductivity, are also used as contact carrier materials. After stamping and forming into desired contact configurations these CuBe materials are then precipitation hardened. CuBe alloys are available as semi-finished materials in a variety of cold work conditions. They can also be supplied and used in the already precipitation hardened condition without significant strength losses. In this case the hardening was already performed at the alloy producer. Since Beryllium is rated as a carcinogen by the European regulation EU-67/548, it has been tried to reach the application properties of the well established CuBe1.7 and CuBe2 alloys with a lower Be content. The development efforts for alternate precipitation hardening materials without toxic and declaration requiring additive materials, for example CuNiCoSi, are aimed at the replacement of CuBe. 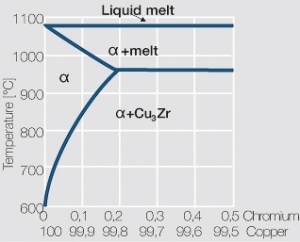 As the phase diagram shows, copper-chromium has a similar hardening profile compared to CuBe Figure 5. In the hardened stage CuCr has limitations to work hardening. Compared to copper it has a better temperature stability with good electrical conductivity. 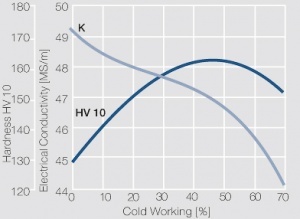 Hardness and electrical conductivity as a function of cold working and precipitation hardening conditions are illustrated in (Figs. 6 – 9), Table 3 and Table 4. Copper-chromium materials are especially suitable for use as electrodes for resistance welding. During brazing the loss in hardness is limited if low melting brazing alloys and reasonably short heating times are used. The solubility of Zirconium in copper is 0.15 wt% Zr at the eutectic temperature of 980°C Figure 10. Copper-zirconium materials have a similar properties spectrum compared to the one for copper-chromium materials. At room temperature the mechanical properties of copper-zirconium are less suitable than those of copper chromium, its temperature stability is however at least the same. The earlier used CuCr and CuZr materials have been partially replaced over the years by the capitation hardening three materials alloy CuCr1Zr. This material exhibits high mechanical strength at elevated temperatures and good oxidation resistance as well as high softening temperatures. In its hardened condition CuCr1Zr has also a high electrical conductivity Figure 11. 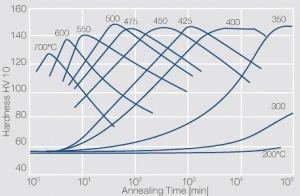 Their usage extends from mechanically and thermally highly stressed parts such as contact tulips in high voltage switchgear to electrodes for resistance welding. This page was last edited on 20 September 2014, at 12:33.